, an ingenious physician and phU losopher, the son of a clergyman at Armley, in Yorkshire, was born Aug. 30, 1705. After being for some time at a private school, he was admitted of Jesus-college Cambridge, in 1720, and was afterwards elected a fellow of that society. He took his degree of A. B. in 1725, and that of A. M. in 1729. He was originally intended for the church, but having some scruples as to subscription to the thirty-nine articles, gave up that design, although throughout the whole of his life he femained in communion with the church -of England. He now directed his studies to the medical profession, in which he became eminent for skill, integrity, and charitable compassion. His mind was formed to benevolence and universal philanthropy; and he exercised the healing art with anxious and equal fidelity to the poor and to the rich. He commenced practice at Newark, in Nottinghamshire, whence he removed to Bury St. Edmund’s, in Suffolk; and after this he settled for some time in London. His last residence was at Bath. Dr. Hartley was industrious and indefatigable in the pursuit of all collateral branches of knowledge^ and lived in personal intimacy with the learned men of his age. The bishops Law, Butler, and Warburton, and Dr. Jortin, were his intimate friends, and he was much attached to bishop Hoadiy. Among his other friends or correspondents may be mentioned Dr. Hales, Mr. Hawkins Browne, Dr. Young, Dr. Byrom, and Mr. Hooke the Roman historian. Pope was also admired by him, not only as a man of genius, but as a moral poet; yet he soon saw the hand of Bolingbroke in the “Essay on Man.” Dr. Hartley’s genius was penetrating and active his industry indefatigable his philosophical observations and attentions unremitting. From his earliest youth he was devoted to the sciences, particularly to logic and mathematics. He studied mathematics, together with natural and experimental philosophy, under the celebrated professor Saunderson. He was an enthusiastic admirer and disciple of sir Isaac Newton in every branch of literature and philosophy, natural and experimental, mathematical, historical, and religious. His first principles of logic and metaphysics he derived from Locke. He took the first rudiments of his own work, the “Observations on Man,' 7 from Newton and Locke; the doctrine of vibrations, as instrumental to | sensation and motion, from the former, and the principle of association originally from the latter, further explained in a dissertation by the rev. Mr. Gay. He began this work when about twenty-five years of age, and published it in 1749, when about forty-three years of age, under the title of” Observations on Man, his frame, his duty, and his expectations,“2 vols. 8vo. His biographer informs us that” he did not expect that it would meet with any general or immediate reception in the philosophical world, or even that it would be much read or understood; neither did it happen otherwise than as he had expected. But at the same time he did entertain an expectation that at some distant period it would become the adopted system of future philosophers.“In this, however, he appears to have been mistaken. We know of no” future“philosophers of any name, who have adopted his system. 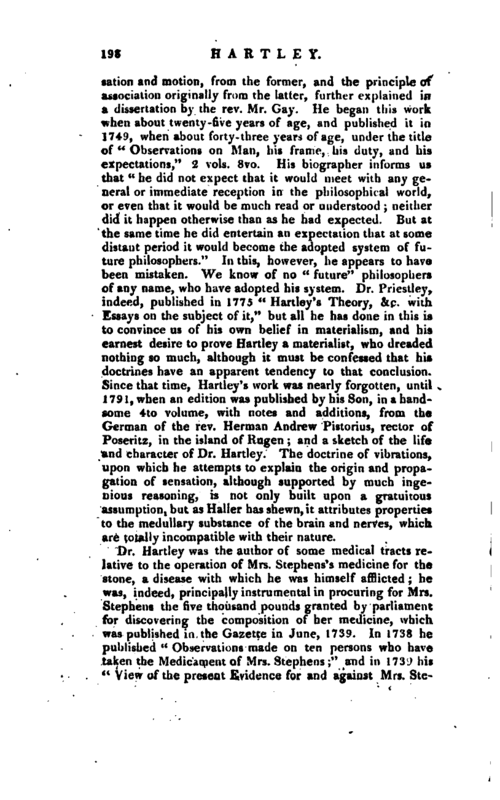 Dr. Priestley, indeed, published in 1775” Hartley’s Theory, &c. with Essays on the subject of it," but all he has done in this is to convince us of his own belief in materialism, and his earnest desire to prove Hartley a materialist, who dreaded nothing so much, although it must be confessed that hie doctrines have an apparent tendency to that conclusion. Since that time, Hartley’s work was nearly forgotten, until 1791, when an edition was published by his Son, in a handsome 4to volume, with notes and additions, from the German of the rev. 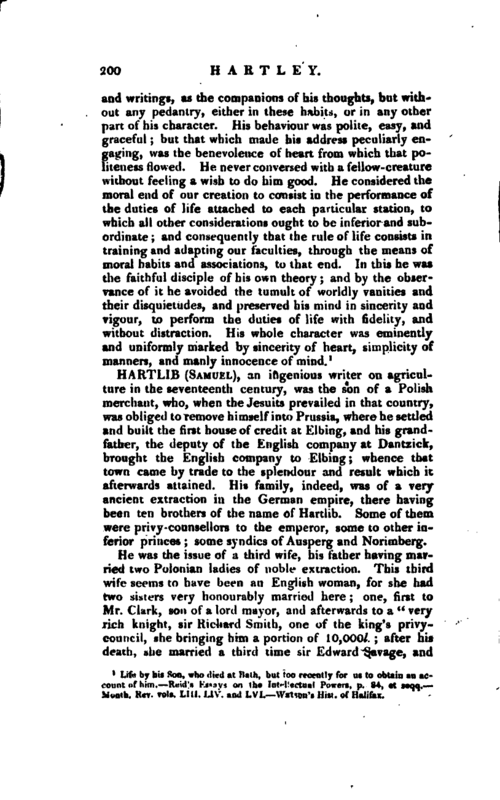 Herman Andrew Pistorius, rector of Poseritz, in the island of Rugen; and a sketch of the life and character of Dr. Hartley. The doctrine of vibrations, upon which he attempts to explain the origin and propagation of sensation, although supported by much ingenious reasoning, isnot only built upon a gratuitous assumption, but as Haller has shewn, it attributes properties to the medullary substance of the brain and nerves, which are totally incompatible with their nature. 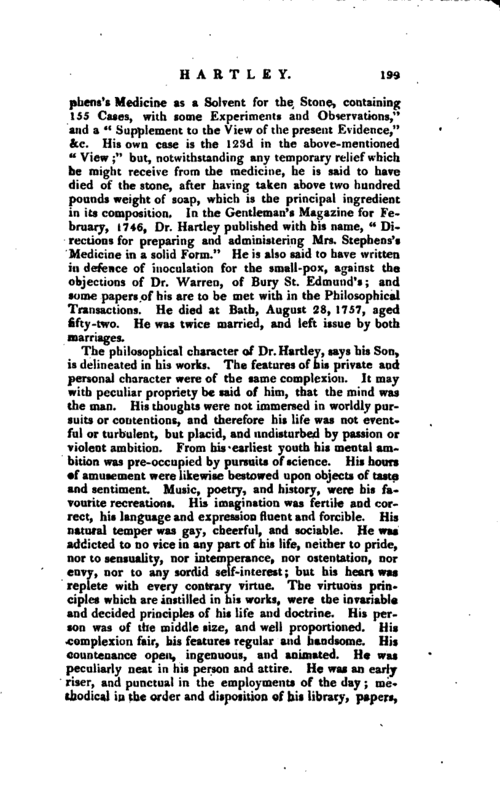 Dr. Hartley was the author of some medical tracts relative to the operation of Mrs. Stephens’ s medicine for the stone, a disease with which he was himself afflicted; he was, indeed, principally instrumental in procuring for Mrs. Stephens the five thousand pounds granted by parliament for discovering the composition of her medicine, which was published in the Gazette in June, 1739. In 1738 he published “Observations made on ten persons who have taken the Medicament of Mrs. Stephens;” and in 1739 his “View of the present Evidence for and against Mrs. | Stephens’s Medicine as a Solvent for the Stone, containing 155 Cases, with some Experiments and Observations,” and a “Supplement to the View of the present Evidence,” &c. His own case is the 123d in the above-mentioned “View;” but, notwithstanding any temporary relief which he might receive from the medicine, he is said to have died of the stone, after having taken above two hundred pounds weight of soap, which is the principal ingredient in its composition. In the Gentleman’s Magazine for February, 1746, Dr. Hartley published with his name, “Directions for preparing and administering Mrs. Stephens’s Medicine in a solid Form.” He is also said to have written in defence of inoculation for the small-pox, against the objections of Dr. Warren, of Bury St. Edmund’s; and some papers of his are to be met with in the Philosophical Transactions. He died at Bath, August 28, 1757, aged fifty-two. He was twice married, and left issue by both marriages. Life by his Son, wbo died at Bath, but too recently for us to obtain an account of him. Reid’s Essays on the Intellectual Powers, p. 84, et seqq. Month. Rev. vols. Liu. LIV, aud Lyi. Watson’s Hist. of Halifax.